(April 22, 2008) Swiss artist Not Vital has been creating sculptures in stainless steel at Currents. 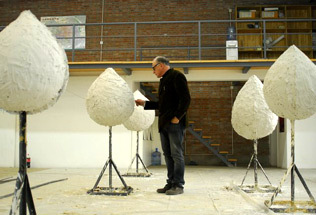 One hundred sculptures will be exhibited in an installation at Currents, and a monumental sculpture will be shown at Galerie Urs Meile in Beijing. Press release: English, Chinese. More info below. (January, 2008) Sarina Tang hosted a dinner in Beijing for the President and Associate Director for The Institute of Advanced Studies at Princeton University. They met with leaders in the financial community, in print media, and in the creative field, both Chinese and American, to add to their understanding of contemporary Chinese culture. 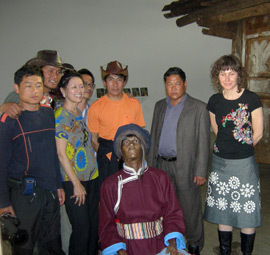 (November 5th, 2006) -- On November 5th, Leader's Quest brought partners from Actis, a group focused on investment in developing countries, to view works by and meet with the artists for a discussion on creativity. (October 22nd, 2006) -- CURRENTS hosted a group of collectors from Asia Society New York led by Melissa Chiu, Director of Museum. 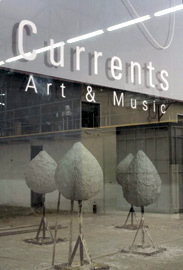 Eight artists met the group and discussed their works on display at CURRENTS. NOT VITAL hails from Sent, Switzerland, population 1000 to the capital of the most populous country in the world, Beijing, China. A singular artist shows his new work. Two Music Events Feature Chinese-American Composer Chou Wen-chung and His Mentor, French Composer Edgard VarFse. CURRENTS Art and Music presented The Beijing New Music Ensemble in a concert on October 14 in Huantie, Beijing, featuring music by internationally renowned composers Chou Wen-chung and Edgard VarFse, with comments by Chou and illustrated by calligraphers. On the same day, Alliance Frantaise provided a unique opportunity to hear Chou Wen-chung describe his music and that of his mentor: visionary and iconoclast Edgard VarFse at a composer presentation in its auditorium. 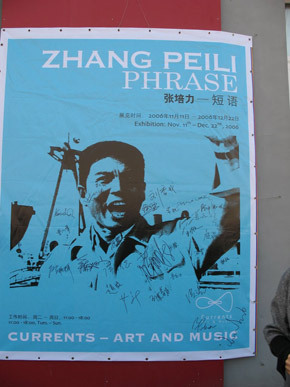 For decades, Chou was a teacher, having founded The Center for US-China Arts Exchange in 1978, at Columbia University. As head of its music composition program, he taught Asian-American composers Chinary Ung, Tan Dun, Zhou Long, and Chen Yi, among many others. Chou met VarFse in 1949, becoming his disciple until the end of his life in 1965, and was instrumental in the recording of Edgard VarFse - The Complete Works, which included many of the pieces he had revised and edited. The Program for the concert included Streams, Windswept Peaks and the percussion quartet Echoes from the Gorge, by Chou Wen-chung, all inspired by classical Chinese culture, particularly calligraphy, and Density 21.5 for solo flute, and IntTgrales for eleven wind instruments and four percussion by VarFse. Concern for the survival of the ancient Mosuo matriarchal minority amidst sweeping changes throughout China has prompted Mathilde ter Heijne to create several new works at Currents Art and Music to be exhibited from May 4 - June 2 with an opening reception for the artist at 4:00 pm on May 3, 2007. A comic book of stories about the culture, people, history of the Mosuo minority and villages will be distributed in the exhibition, at the museum in Xiao Loshui village, and to the schools in the neighboring villages for free. 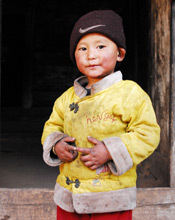 As the Mosuo has no written language, this is a unique way for children to avail themselves of their own culture. Other audiences can also learn about the matriarchal system as practiced by the Mosuo people through this comic book. The artist, accompanied by CURRENTS Director Sarina Tang, cinematographer Andrea Cavazzutti, and photographer Lin Jing, recorded the environment around Lugu Lake, the people in their daily activities, and life in the remote and therefore unchanged mountain village of Lijiazui. Mosuo Fireplace Goddess illustrates that equality between genders is achievable and that this exhibition may contribute to a better understanding of the Mosuo people and their unique social and cultural systems. Mathilde ter Heijne’s work has been shown extensively in Germany and other parts of Europe, as well as in Los Angeles, New York, Mexico City. 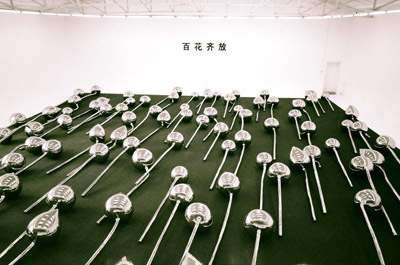 Most recently, her sculptures were featured at the Shanghai Biennial 2006. The centerpiece of the exhibition is a 200 year-old authentic zumu or grandmother’s house from the village of Lijiazui, Yunnan province brought to Beijing for the exhibition. 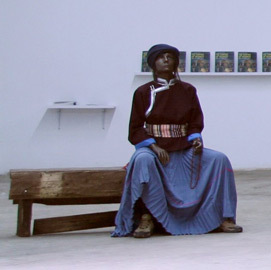 Inside the house, sculptures in bronze as doubles of artist, inhabit Mosuo characters. 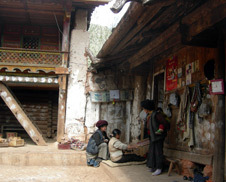 Video projections in the exhibition recreate the village environment and the cultural practices of the Mosuo people. 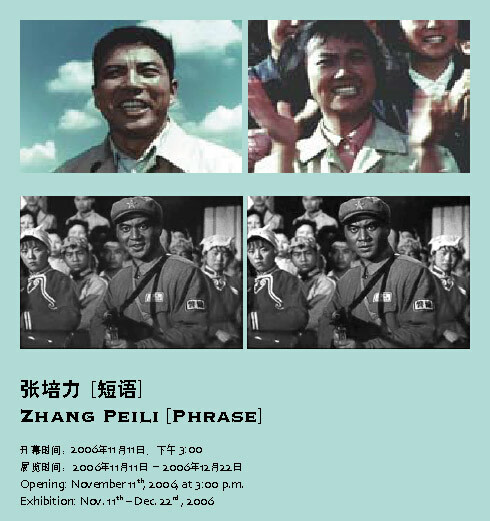 On November 11, 2006, CURRENTS is honored to present an exhibition by the master of video art in China, Zhang Peili, the director of the new media department at the China Academy of Fine Arts in Hangzhou and pioneer of avant-garde art in China. He had a solo exhibition at the Museum of Modern Art New York in 1998, participated in the 1999 Venice Biennale, the 2001 Yokohama Triennale, as well as the inaugural exhibition of the Mori Museum in 2003, Tokyo, Japan. Zhang Peili, director of New Media Department at the China Academy of Fine Art Hangzhou, has created an interactive video Phrase. The exhibition also features Happiness, an installation appropriating excerpts from a 1970' film In the Shipyard. For directions and map, see The Space page. Following the concert, taxis and shuttle vans will be available just outside the courtyard. featuring Zhou Long himself introducing music as performed by the Beijing New Music Ensemble. This is the first public event offered by Currents Art and Music, located in new Huantie arts area.